is currently a Researcher in Stratigraphy and Sedimentology at the University of Camerino (Italy). He received his degree in Geology from the University of Camerino in 1995 and a PhD in Earth Sciences from the University of Pisa in 2002. Prior to joining the STRATGroup at the University of Liverpool in April 2006, he spent about 3 years as postdoctoral research assistant at the University of Camerino, working on the Neogene of northern Chile and central Italy. At Liverpool, he spent two years as a postdoctoral research assistant and was involved in the industrysponsored Slope 2 Project. His research was focused on developing models for the depositional architecture, internal fills styles, and sequence stratigraphic framework of slope channel-levee complexes exposed in the Laingsburg depocenter of the Karoo Basin (South Africa). 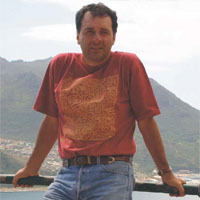 Most of his past research has focused on the construction of high-resolution sequence stratigraphic frameworks for Miocene, Pliocene, and Pleistocene shallow-marine clastic successions exposed in active extensional and compressional settings, such as central Italy, Ecuador, and northern Chile, with particular emphasis on the relative impact of both Milankovitch-driven sea-level changes and tectonics on their final stratigraphic architecture. His current research interests focus on the role played by external controls on the nature and timing of deepwater deposition, characterization of deepwater reservoir outcrop analogues, and application of hierarchical stacking patterns in deepwater sequence stratigraphy. © All material copyright of University of Basilicata and University of Camerino - WebMaster: Geomore S.r.l.